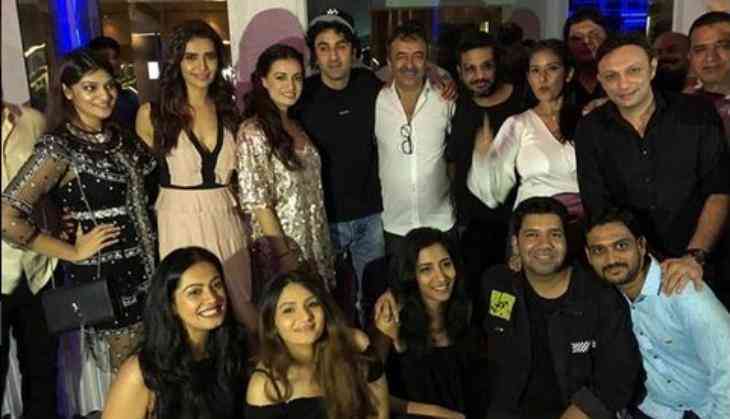 Bollywood hit director Rajkumar Hirani throw a success bash for his recently released film Sanju on Monday, the Ranbir Kapoor starrer film Sanju made 120 crores in its opening weekend. The film has even broken all the previous records of the box office and it has got the love from the critics and the audience. Besides Sonam Kapoor, Anushka Sharma, and Vicky Kaushal, all the actors came under one roof to celebrate the grand bash of Sanju. Now many videos of this success bash are coming out on social media. All the star cast had fun in this night of success. The who team praised a lot to the leading actors Ranbir Kapoor, Vicky Kaushal, and Paresh Rawal for their super success performances. Vicky Kaushal who is busy in the shooting of his recent working film Uri won't be able to attend this success bash. However, Vicky Kaushal's father Sham Kaushal who was also the action director of the film attended this bash. In this success bash, director Rajkumar Hirani and Ranbir Kapoor gave an emotional speech over and made everyone went into tears. While talking about the current box office update, then the film Sanju has made 145 crores in four opening days.